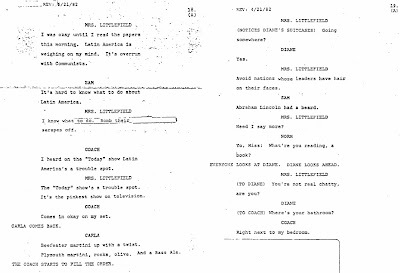 “The character was named Mrs. Littlefield. She was an opinionated old broad from the D.A.R. She was in the pilot and the decision to drop the character was made after it was filmed. Politics just didn't fit with the mix. So they cut out her part, but there are a few shots here and there where she is still in the background. Just look for a sweet white-haired little old lady who used to have lines. Since several back-up scripts were in the works before the pilot was filmed, we also had to go back and write her out of those episodes as well. “That’s what they say: ‘War is gross.’” The first amazing thing about this line is that Danson dares to play it melancholy, not like a punchline, letting us know that there’s something under the laugh: We’re here underground hanging onto our working-class traditions in this bar but there’s a younger, more privileged generation up there with a breezy contempt for those traditions who literally cannot conceive of what real suffering is like. “This is the thanks we get,” the kid says in faux-reactionary outrage as he turns his back on Sam’s world. Our heroes would spend the next eleven years camped out in this bunker as their working-class world was gradually demolished above them. More and more bartenders now have (useless, overpriced) college degrees. 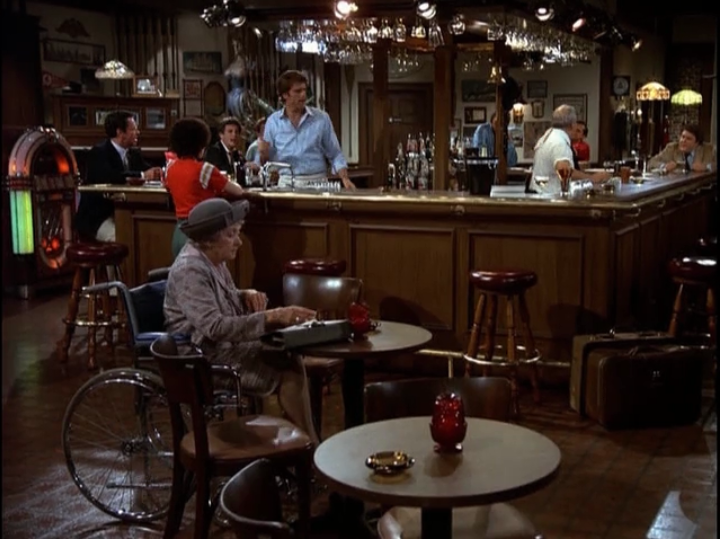 We’re all Diane Chambers now. 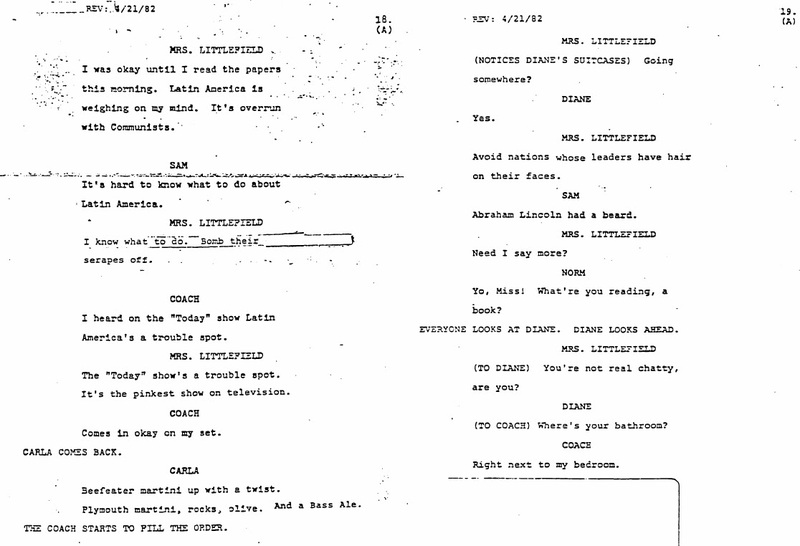 Mrs. Littlefield was an attempt to inject partisan political humor into the show, but it didn’t work, because the show was really about class politics, albeit only implicitly, and that was a subtle source of its power. Kudos for another excellent piece of practical writing advice, deft analysis and -- really calling it what it is -- scholarship. This reminds me of your previous posts about the changes to the opening of CHINATOWN and about Matthew Weiner's influence on THE SOPRANOS. Nothing like primary sources to validate your hunches or illuminate your ideas in wholly new dimensions.